Above, petroglyphs at Nukhen Utug, Mankhan soum, Khovd province. When traveling through historical sights in the US, we are accustomed to being fenced off, roped off and warned ('don't touch!') lest we break, ruin or somehow deface places and things of value. Rightly so, the past can at times be fragile and should be protected. That being said, it is somewhat thrilling to encounter ancient rock art and hand-carved monuments bereft of fences, ropes and signs. Indeed, they are just out there in the open, available for photos and moments of quiet contemplation about how these thousands years old objects came to be. 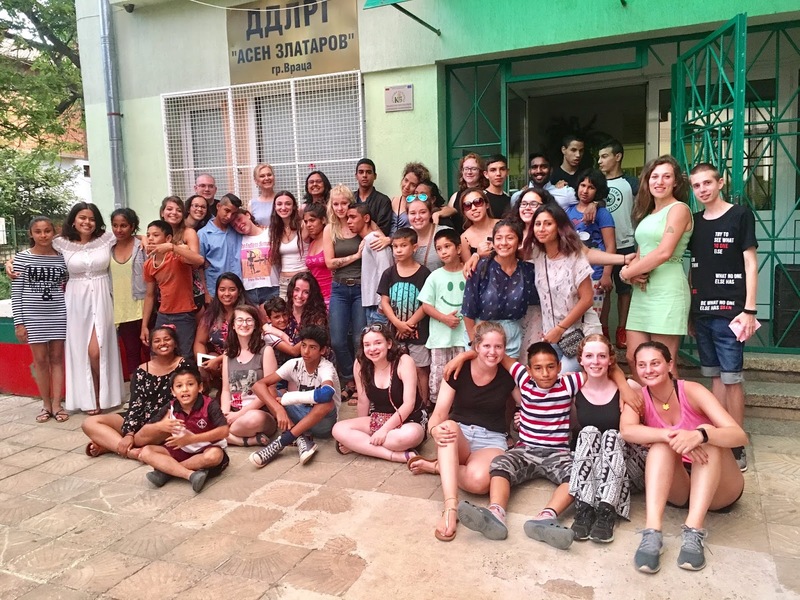 In August, Corawill had their largest group of volunteers ever volunteering in Vratsa, Bulgaria. The 23 volunteers included students from Western Connecticut State University's (WCSU) Creativity and Compassion Club and Danbury High School (DHS). This year, two volunteers were on their third trip with Corawill to Bulgaria. We were joined by a wonderful group of Bulgarian volunteer translators. Our activities centered on two social homes, one for special needs children. The activities included games, sports, 'magic sand,' painting and puzzles. The students from WCSU also shared aspects of their traditional backgrounds, with one volunteer showing everyone how to wrap and rock an India sari. We all played endless rounds of UNO and the matching game and had a blast with a Mexican piñata. We also made s'mores and American pancakes with fruit. Our painters put a shiny new coat of chocolate brown on the fence that surrounds the faciltiy and we ended the week completing hand-prints with biographical poems translated in English and Bulgarian so that we call all learn about each other. The highlight for everyone seemed to be our two trips to the community pool with an ice cream treat. The volunteers also took the children to the Ledenika Caves where everyone enjoyed the light show. It was cold inside! The final day ended with our traditional pizza party and music. Many new friendships were formed. Many volunteers expressed interest in returning next year. See you then! On the way to Ulgii from Murun. a wide way leading from one place to another, especially one with a specially prepared surface that vehicles can use. a series of events or a course of action that will lead to a particular outcome. For people used to car travel in the US and Europe, a holiday road trip in Mongolia could present a journey in semantics: for example, what is a road? On a recent SUV journey across Mongolia, we found that from Murun to Ulgii just 70 of the 1500 kilometers is paved. Or, for those of us who regularly travel interstate highways in the US, what is a road-side restaurant? In that vein, what is lunch? or a toilet? Traffic jams can be quite different in the Mongolian countryside, and they may not include cars. As the saying goes, "it's the journey, not the destination that counts." In total, my partner and I, along with our guide Chimeg and driver Baysaa, covered 5500 kilometers on our vacation. We traveled from Ulaanbataar to Murun, on to Tsagaannuur where we jumped on the horses to visit the Dukha reindeer herders, back to Murun, continuing to Ulgii, finally returning to Ulaanbataar through Altai and the Gobi. From forested taiga in the north, to the snow covered high peaks and glaciers of the west, to the desert like 'mini-Gobi' in the middle, it was a great adventure. And along the way we learned new social-cultural meanings surrounding the semantics of cross-country road travel in Mongolia. I would also add the term 'luxury travel' to this list. No five-star hotels, swimming pools or Michelin starred restaurants were to be found for us outside the capital, but the peace and quiet of the countryside, the amazing star filled nights, the endless blue day sky, myriad flowers, birds and domesticated beasts, and the wonderful hospitality of the Mongolian people was indeed luxurious, serene, and yes, priceless. 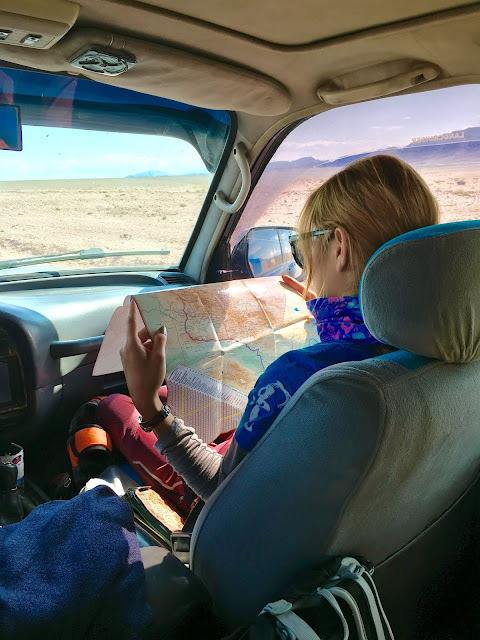 Unless you are a professional mechanic, speak fluent Mongolian, and know how to find your way around this country on unmarked roads, do not attempt this type of travel without an excellent guide and driver. Many thanks to Chimeg, founder of Classic Journeys Mongolia, and to Baysaa and his trusty 1997 Toyota Land Cruiser for our adventure.